assortment of miraculous food items. No one realized at the time, but the 1977 appearance of Jesus Christ on a flour tortilla set the international standard for miracle sightings. Once confined to obscure grotto appearances, the Tortilla was the crossover miracle that put God in the Extra Value Meal of the average American. Now, no object is too outrageous for an Almighty (or Virgin Mary) cameo. He's materialized on a Pizza Hut billboard in a plate of spaghetti; on a bowling alley chimney; reflected from a porch light onto a car bumper (until the light was turned off and the car moved); on a diner place mat; and even on a dead priest's shoe. But the Miracle Tortilla was the first to fully wrap around the collective pop subconscious. In October of 1977, Maria Rubio was rolling up a burrito for her husband Eduardo's breakfast, when she noticed a thumb-sized configuration of skillet burns on the tortilla that resembled the face of Jesus. Needless to say, Eduardo went hungry that meal as Maria told family and neighbors of the miraculous event. It happened in the small town of Lake Arthur, New Mexico, 40 minutes south of Roswell. Space Alien fever had yet to infect the state, and visitations were of a predominantly religious nature. NM's historic Chimayo Shrine, with its miracle dirt pit, drew thousands of annual visitors looking for spiritual connection to the miraculous cross that burst from the hillside in 1810. Elsewhere, statues occasionally shed a tear, or passing clouds took on the shape of the Blessed Mother. Wide-eyed believers call them "signs." Cranky skeptics ascribe them to a human faculty for delusion called "pareidolia," a perception of pattern and meaning from natural randomness. At the same time, scientists believe humans are hardwired to recognize facial patterns, our hunkered fore-apes' need to quickly identify foe, friend or mate. We'll perceive a familiar face in an unfamiliar place, before seeing, say, a locomotive or a cotton gin. Despite the braying of scientists and skeptics, the Holy Tortilla quickly developed a solid fan base. By 1979, over 35,000 people had visited, bringing flowers and photos of sick loved ones. Mrs. Rubio quit her job as a maid to attend full-time to the hastily constructed "Shrine of the Holy Tortilla" in her home. When away, she'd leave the door unlocked so that no one would be denied access. She mounted the Tex-Mex Relic in a wooden frame under glass, a puffy wad of cotton along the bottom making it appear as if Tortilla Christ was suspended just inside the Pearly Gates. In the wake of this first Tortilla visitation, all heaven broke loose. November 1977 -- a competing Miracle Tortilla appeared in the skillet of Phoenix housewife Ramona Barreras. It was the face of Jesus, this time accompanied by the letters K, J, C, and B, which Ramona believed stood for "King Jesus is Coming Back." According to the Phoenix New Times in 1997, the Barreras Miracle Tortilla "rests in a Plexiglas box in a kitchen drawer." In March 1983, housewife Paula Rivera claimed the image of Jesus appeared on a corn tortilla she was making in Hidalgo Texas. She created her own "Shrine of the Holy Tortilla." In the meantime, the faithful still traveled to Lake Arthur to see the original. Mrs. Rubio eventually moved it to a small wooden shed in the backyard. Years of merciless southwestern heat have literally fried and refried the tortilla. The image, once recognizable even in photographs, has faded to a half dozen brown spots and a wiggly burnt blotch. 2004: A banner year for almighty manifestations, notably the much hyped miracle grilled cheese sandwich bearing a resemblance to the Virgin Mary; and an image of the Lord on a man's dental x-ray, above his front teeth. March 2005: Slow start this year for US miracle sightings; a man in North Carolina noticed a brick in his home that looked like Jesus, and promptly headed for eBay. "Lucky" the turtle, lone survivor of a pet store fire in Indiana has an image of Satan roasted onto his back. December 2006: Disaster! In 2005, Mrs. Rubio's grandaughter took the Miracle Tortilla into school for Show and Tell, and it was dropped and broken! The shed shrine has been closed and the remains retired to a drawer in the Rubio's home. Matteo Brandi, 38, may hope to repeat the success of a Florida woman who sold a piece of toast said to bear an image of the Virgin Mary for $28,000. The Italian said he had found the shell, whose contents have since been eaten, in a batch two years ago. The oyster stuck to his hand as if God was calling him, he said. Mr Brandi, who describes himself as a devout Catholic, told Switzerland's Le Matin newspaper he had kept the shell on top of the bar's stereo after he found it. This piece is unique - it is the work of nature, it is neither grilled nor cooked. He has now given it to a bank for safe keeping. He became aware of its potential value only after hearing of the Florida sale. "This piece is unique," he told the newspaper. "It is the work of nature. It is neither grilled nor cooked. I shall try my luck over the internet." Diane Duyser caused a stir last November when she put her unusual piece of cheese-on-toast on the eBay auction website. The toast, which Ms Duyser said had brought her great luck over 10 years, was sold to an internet casino within days. The item received more than 1.7 million hits. And the Marmite was God! pie stuffed with cheese or vegetables. Donna Lee and her husband Tommy are keeping it in the freezer. They listed the pie on eBay. POINT PLACE -- A Toledo area family has now sold a pie that some say has a vision of Jesus Christ on it. The Lees says they found it on Easter and it was too good to eat, so they put the blessed pastry on the online auction site eBay. Now it has sold for $1775 to an online casino. Donna Lee has kept the image of Jesus frozen in a plastic bag since that holiday in April. She first noticed it while cooking pierogi's. "The last one I flipped over was Jesus, so I flipped the spatula, and my husband goes, 'What? There's Jesus!' and he goes, 'Oh my God!'" said Donna. Her husband agreed, saying, "There's a face on our pierogi and we choose to believe on Easter it's Jesus." The image of Christ was on one of 12 pierogi's that came from the store. For the uninitiated, a pierogi is a Polish delicacy made up of a pouch of dough filled with a savory filling like meat, cheese, or vegetables, and cooked by boiling and then pan-frying. It's very similar to a dumpling. "They're usually browned one side and browned on the other but this one was the only one that didn't brown on both sides," said Donna. "It's very special and they've made a joke of me since April, so I don't know, it just means a lot to me." Donna works at St. Vincent Mercy Medical Center in Toledo, and the doctors there don't apparently think it's a joke. "I don't know to explain it, but the doctors at the hospital say, 'Before I go into surgery let me touch you,' and I say please don't." Both Donna and her husband were born and raised Catholic. They pray daily and also understand that some would consider this pretty bizarre. So what will the Lees do with the heavenly pastry? "We thought we put it on eBay and see what happens," said Tommy. They set the minimum bid at $500 dollars. "Everything happens for a reason, and I think this one did. I truly do," said Donna. By Monday afternoon, the auction ended, with Golden Palace Casino winning the pie for $1775. Last fall, a woman sold a grilled cheese sandwich with a vision of the Virgin Mary on eBay for $28,000 dollars to Golden Palace Casino. The company says it will put the pierogi with its travelling road show of oddities. MARION COUNTY, Fla. (WOFL FOX 35, Orlando) -- Pastor Renee Brewster and her husband Bishop Winston Brewster are a very spiritual couple. But the site of their savior in a potato has reinvigorated their faith and their desire to help others. She thought she got her sign right off the bat. “The first potato I split in half and put it to the side because it looked rotten. It was her 10 year old granddaughter who made her give the potato a second look. “My granddaughter said Granny did you see that in the middle? I said what?" And taking a closer look she saw the cross with Jesus in the middle. "It’s remarkable. Even when I cut the good part off the cross ended up being shaped like a tomb from long ago. Pastor Brewster froze the heart of that potato bearing Jesus. The rest was used to make the potato salad served during their weekly rescue mission. “How was that potato salad? “It was good. It was the best you ever made...it was almost as good as Sister Frankie's,” said Bishop Brewster. The potato did more than feed them physically. It nourished them spiritually and helped reinvigorate their mission. “The holiday season was there and we didn't know how in the world we were going to be able to bless...but we did and when this occurred it gave us this extra motivation that intuition hey we aren't in this alone,” said Bishop Brewster. “I just want people to know God is still as real today as he was back then and he can show up anytime he gets ready,” said Pastor Brewster. How about some Indian Chapati? A Romanian family is bracing itself for a veritable crusade of pilgrims after discovering the likeness of Jesus flanked by Saints Peter and Paul in a humble wardrobe, Ananova reports. Valeriu Junie, 66, says he spotted the holy trio about a year ago while watching TV. The epiphanised Junie recalled: "I turned on the light and saw the image of Jesus in the middle and those of St Peter and St Paul on the sides. I didn't say a word to anyone for a few weeks but then the images started to become clearer everyday. 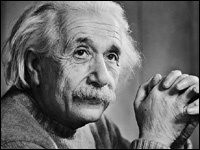 I decided to call the priests and since then lots of people come to my house to see the miracle." Local priest Vasile Nuhaiu confirmed: "I was shocked by what I saw there. There were three shadows on that wardrobe with the face of Jesus Christ in the centre. It is a miracle when Saints reveal themselves to us mortals and I crossed myself and started to pray. I told the two old people they should fast and pray to those holy images." The report notes that the wardrobe is made of walnut and was part of a dowry from Junie's inlaws. Those of a woodworking bent will probably realise that the wardrobe is actually simply adorned with book-matched walnut veneer, leading us to believe that this is not in fact Jesus plus disciples, but rather the Son of Man sliced into thin slivers and then glued to a (pine or oak?) carcass by a careless Romanian wardrobe maker. Saturday 4th September 2010, 7:14AM BST. A 'holy' relic? 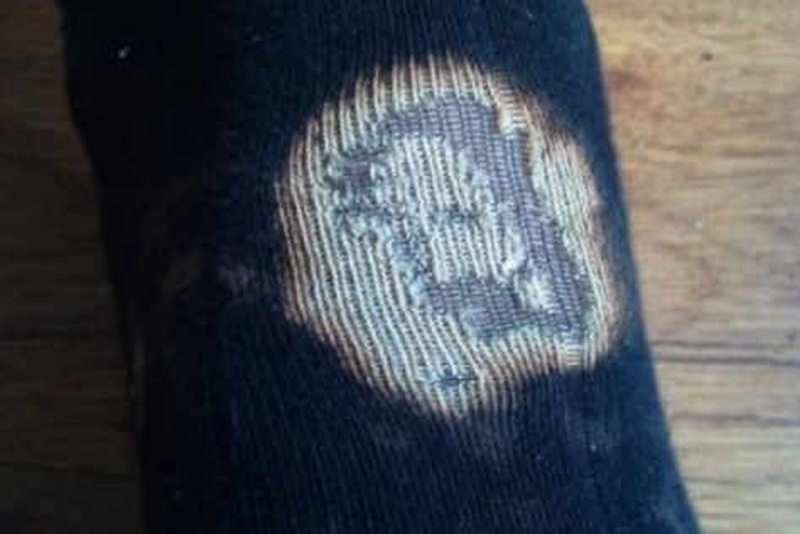 Oswestry man, James Henderson, found the face of Jesus on his sock. He’s been seen in clouds and even on pieces of toast. But now one Oswestry man has discovered Jesus on his sock. James Henderson, 23, of Bailey Street, took off his shoes as he relaxed on holiday to find this striking image of the Son of God peering up at him from his holey sock. “It was a massive shock to me,” he said. James said he and his friends decided to travel around Europe as part of a 10-day holiday. He said he had spilt bleach on one of the socks while at work and somehow ended up taking them on holiday. But the image of Jesus did not appear until the end of his travels. They returned from holiday on Tuesday. He said: “It was on the last day of my holiday and I took my shoe off and there it was. “My friends were sitting next to me and I called them over and their reaction was the same. It was a big shock to them. “I am not especially religious but it was a shock. James has kept the sock and is still deciding what to do with it. MEXICO, Maine –A Maine woman who discovered an image of the Virgin Mary on a blackened wall following a weekend house fire says she plans to rebuild the dwelling and cut out the image so she can put it on display. The image was declared off-limits to visitors after Veronica Dennis followed her insurance company’s instruction to board up the house out of concern for the safety of people entering the fire-damaged structure. Dennis’ home caught fire Sunday morning after a space heater in her daughter’s bedroom ignited a bed and a nearby dog bed. The image was revealed when she removed a framed painting from the kitchen wall, which was blackened by smoke and fire. Dennis expressed concern that visitors looking to view the Virgin Mary image could turn her home “into a three-ring circus” and she was adamant that she has no intention of selling the property she has owned for 11 years. “This is my house,” she said. “My neighbors wouldn’t appreciate it either if I sold the house and they turned it into a shrine. I will rebuild the interior, and, the image that’s on the wall is on paneling, so I will cut it out, and it will remain in the house,” she said. Police and neighbors who have been keeping watch on the Burton Street home said they saw no unusual activity after news of the image spread through the media, including The Associated Press, which transmitted a Sun Journal newspaper photo around the world. WATAUGA, Texas, Sept. 19 (UPI) -- A Texas bar owner who happens to be a police officer says he was shocked when he learned his son saw the face of the Virgin Mary in a lemon slice. Sam Nance, a member of the Watauga police force, said his son, Marty, revealed the Virgin Mary's face on a lemon he was cutting at the family's business, the Texas Billiards bar, The Fort Worth Star Telegram reported. "It kind of freaked me out," Nance said. "I'm a detective, and I believe in facts." When he looked at the lemon, Nance said he sort of saw the face. It wasn't until he took a picture of it that the countenance really was visible to him. Nance is Methodist and his wife is Baptist, and they don't attend church every week. He said they're saving the lemon in their freezer so others can see it.